Read Billy's review of Creed II. Life has become a balancing act for Adonis Creed. Between personal obligations and training for his next big fight, he is up against the challenge of his life. Facing an opponent with ties to his family’s past only intensifies his impending battle in the ring. Rocky Balboa is there by his side through it all and, together, Rocky and Adonis will confront their shared legacy, question what’s worth fighting for, and discover that nothing’s more important than family. Creed II is about going back to basics to rediscover what made you a champion in the first place, and remembering that, no matter where you go, you can’t escape your history. Creed II is in theaters on November 21st, 2018. 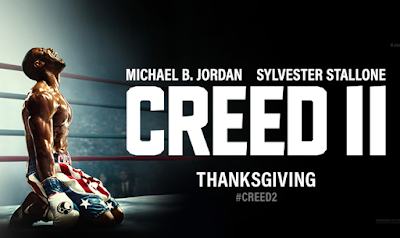 First let's start off that you do not need to remember all the details from the original Creed to enjoy Creed II. However, you may want to watch Rock 4, as the details from that Rocky come into this movie. It is not life or death, you will be able to still follow along, but the little details you will miss is because you didn't watch Rocky 4. 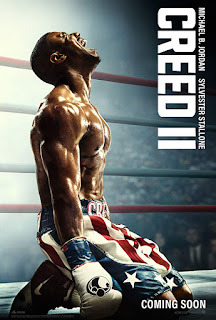 Creed II is an even paced movie, for every one minute of down/slow pacing, there's one minute of excitement. You maybe thinking that this will be a slow movie then, but you would be wrong. With a run time of over two hours, that means there is a good hour of straight action that keeps you well into the movie. If you feel like you might be getting lost with the different plots, that are undertaking this movie, don't worry. The movie does a nice job of wrapping things up, so plots you might have forgotten come back into the light and ends nicely. Just keep chowing down on that popcorn and enjoy the movie, they will let you know things when you need to know them. 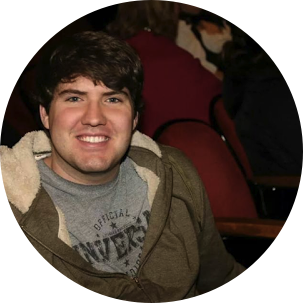 You audience will burst into cheers and applause, with some people yelling at the screen. Don't make this detour you from going. You will also be applauding, and exciting for what you will witness on screen. I recommend seeing this one with a family, or group of friends. You will all be hyped going into the movie, and you will all be hyped after the movie. This one did not disappoint.